Working Films’ home state of North Carolina gained national attention this year for its Moral Monday protests, when thousands gathered at the capitol building every Monday from April through July to protest the regressive actions of the state legislature. From cuts to unemployment insurance, to tax cuts for the state’s wealthiest citizens, loosening of environmental regulations, to suppressing the right to vote – a multitude of harsh new policies are threatening the social safety net, education, the economy, voting access, women’s health, and the environment. We’ve responded with a plan to position and leverage Reel Engagement films to support and build on the momentum of the Moral Monday/Forward Together movement. Participants at the NC Engagement Strategy Convening October 2013. 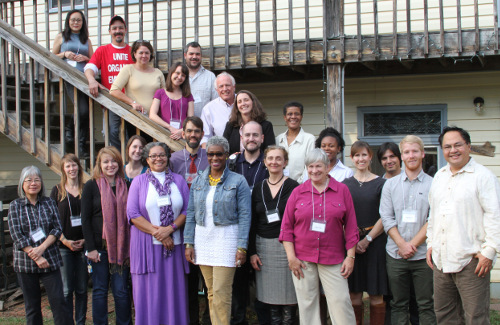 On October 29th, in collaboration with stone circles, the North Carolina NAACP, the North Carolina Justice Center, Clean Water for North Carolina, and Democracy NC, we hosted a full day training and strategy convening among nonprofit leaders from around the state. The meeting was designed to offer best practices and specific guidance in using film to advance organizing for social and environmental justice, and to facilitate strategy development across multiple issues with film at the center of those efforts. Participants left with specific plans to take back to their organizations and to pursue in partnership with each other. In particular, we devised ways to use films, online and off, to reach the “movable middle”. These efforts will unfold as part of a screening series and tour in 2014. After the convening, in partnership with Responsible Wealth and stone circles, we hosted a closed-door sneak-peek screening of Citizen Koch. The event brought together individual donors, representatives of giving circles and community foundations with leaders of the Moral Monday mobilization, including NC-NAACP President, Rev. William Barber. Citizen Koch is a new film by award winning filmmakers Tia Lessen and Carl Deal that highlights the ways in which big donors are influencing elections and gaining control of the entire political process. After the screening, audience members had an opportunity to speak with NC-NAACP, NC Justice Center, and Democracy NC organizers about specific ways they can be supportive through giving and as spokespeople. The day energized us and reinforced our commitment to fight alongside our allies in the state to protect the people and the environment in North Carolina. Stay tuned to our blog in the new year for updates on our work build power and participation among citizens in the Tarheel State for a brighter and more sustainable future.